You are here: Home / About Us / OICR Hosts 7th Research and Education Forum featuring JD Vance, author of "Hillbilly Elegy." OICR Hosts 7th Research and Education Forum featuring JD Vance, author of "Hillbilly Elegy." Experts discussed the opioid epidemic and the harrowing effect it has had on communities at a GW forum. Author J.D. Vance might have never gotten out of the small Ohio town where he grew up if it weren’t for his loving grandparents. While his mother struggled with opioid addiction, he found a safe haven in their home, he said. In communities wrecked by drug addiction and overdose deaths, grandparents are stepping up to take a greater role in raising their grandchildren, Mr. Vance said. But not all children are lucky enough to have extended family who can intervene the way his did when his nuclear family fell apart. Mr. Vance wants to make a difference one person and family at a time, he said while speaking Wednesday at the George Washington University about the opioid epidemic. The Hillbilly Elegy author returned to his home state earlier this year to start “Our Ohio Renewal,” a nonprofit organization dedicated to addressing the opioid crisis and improving educational and employment opportunities in the Buckeye State. “If enough people get their hands dirty and try to make a small difference even then hopefully it adds up to something much bigger, and we start to steer toward a solution,” Mr. Vance said. 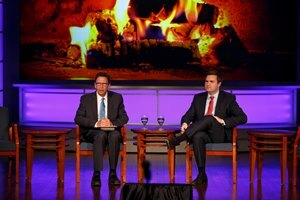 Mr. Vance participated in a “fireside chat” about the opioid epidemic with Frank Sesno, director of the School of Media and Public Affairs. He talked about his life, best-selling book and the factors he believes contribute to the drug epidemic in rural communities like Middletown, Ohio. The event, titled GW/ICF Research and Evaluation Forum Opioid Use: An Epidemic of Addiction, Not Abuse, was co-sponsored by GW’s Office of Industry and Corporate Research, the Milken Institute School of Public Health and ICF, an industry partner that together with GW focuses on public health issues. Thomas Russo, GW’s assistant vice president for industry and corporate research, opened the event. He said the forum was “thought provoking” at a time when 91 Americans die of opioid overdoses every day, according to the Centers for Disease Control and Prevention. Job loss and a lack of opportunity have contributed to high rates of addiction in Appalachia’s rural communities, Mr. Vance said. A more general sense of dislocation and decline have also played a part, he said. When the community stops thriving, residents feel pessimistic about their future opportunities. Lynn Goldman, Michael and Lori Milken Dean of Milken Institute SPH, led a panel discussion in the afternoon with substance abuse and health experts. It is “sobering” that more than 10 million Americans are personally impacted by opioid abuse, she said. Many others are affected through struggling family members and friends. Grant Baldwin, director of the division of unintentional injury prevention at the National Center for Injury Prevention and Control for the CDC, said 64,000 Americans die every year from drug overdose. Eight out of every 10 of those deaths are linked to opioid use. The epidemic was inflamed by doctors in the 1990s who started liberally prescribing opioids for pain management. Over the last few years people have come to understand how addictive and potentially lethal these drugs can be, he said. President Donald Trump declared the opioid epidemic a health emergency last month but did not request funds that would help government agencies combat the problem. Addressing the epidemic through federal policy is a challenge, Dr. Goldman said, because of the sheer breadth of the problem. Jennifer Fan, a pharmacist with the Center for Substance Abuse Prevention, Substance Abuse and Mental Health Services Administration, said it’s important that government agencies partner with external stakeholders to find solutions. Efforts should include combating stigma, increased awareness and education around opioid addiction and connecting addicts with a long-term treatment plan after they receive Naloxone, a medication that reverses the effects of opioid overdose. Gary Mendell, chair and CEO of Shatterproof, a nonprofit organization dedicated to ending the pain addiction causes families, witnessed the devastation of addiction firsthand when he lost his son to it in 2011. Since then, Mr. Mendell has been dedicated to raising awareness around addiction and advocating for treatment and recovery efforts. The United States needs to approach the opioid epidemic with systemic action by investing in large-scale distribution of Naloxone, he said. One reason this approach is not happening now is because the public is not demanding it. Sudhakar Kesavan, ICF chairman and CEO, gave closing remarks.